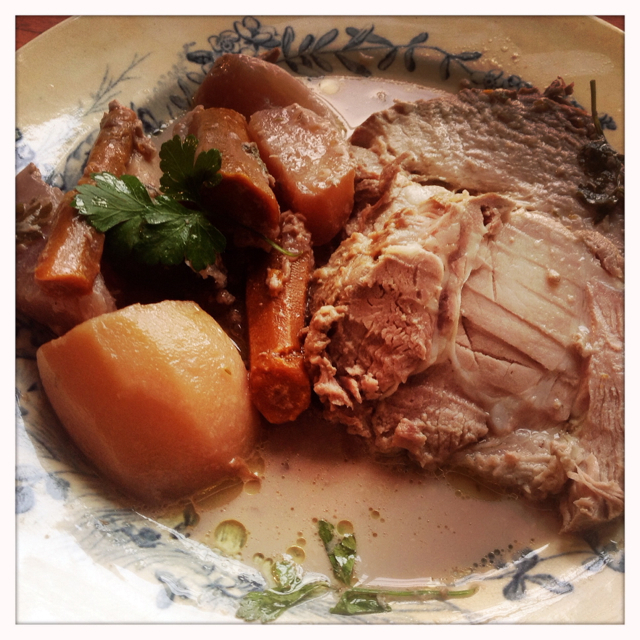 Roti de Porc au Lait (Roast Milk Pork) …tonight! LOVED this dish tonight! I know I’ve put this recipe up earlier this year, but had to share it again… with the “NEW”photos! The nights are cooler, Benji is now in harvest swing and it’s time to cook up some warm, slow-cooked meals… Bon app. 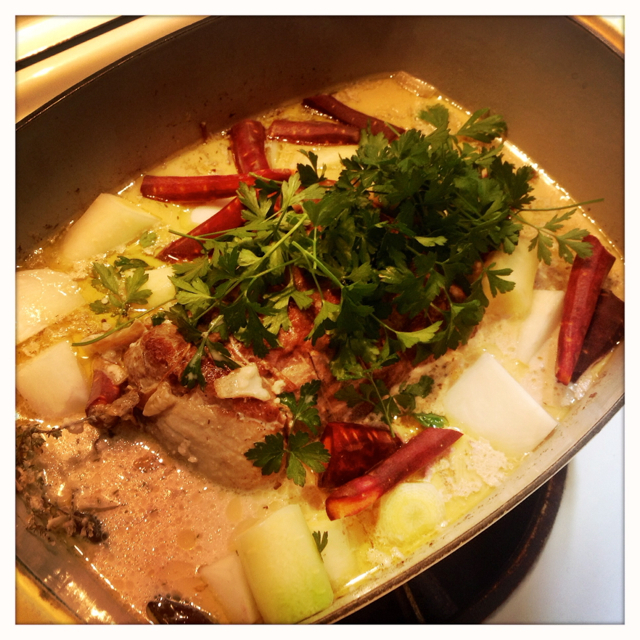 I was on the phone to Mum and Dad last week and mentioned that I’d just cooked up some Milk Pork – ‘Porc au Lait’ – for the next day’s dinner. It’s funny, these conversations about food are always totally out of whack with our time zones. It was 11pm my time and 8.30am the following morning, their time. Normally it’s me cleaning up the breakfast dishes as Dad explains with excitement what he’s got on the stove for dinner. I’ve never served them Porc au Lait but I know they’d love it. It ticks all our family’s favourite food boxes: MEAT, lots of sauce, herbs, garlic and the required ‘three veg’ – and it is easy to prepare. It’s one of those old-fashioned French dishes that is simply delicious comfort food. My husband and mother-in-law showed me how to cook this years ago and I can’t count how many times I’ve prepared it since. 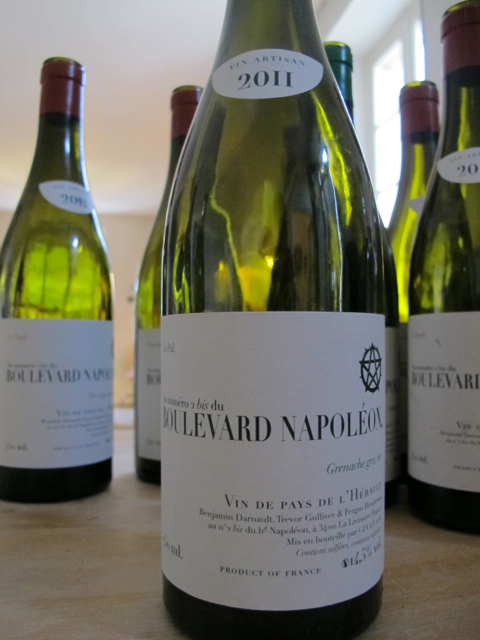 We had the poker men for dinner + a few UK visitors and it went down a treat with the new ‘Boulevard Napoleon‘ wines – white and red. 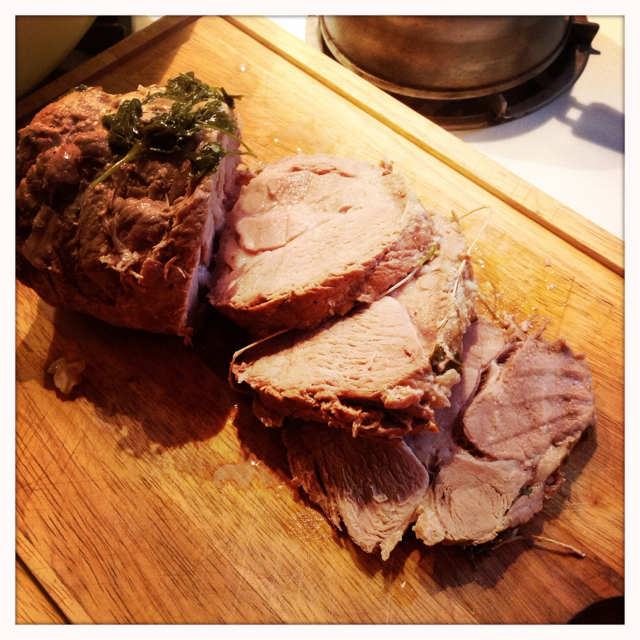 …to serve with this incredibly juicy meat. 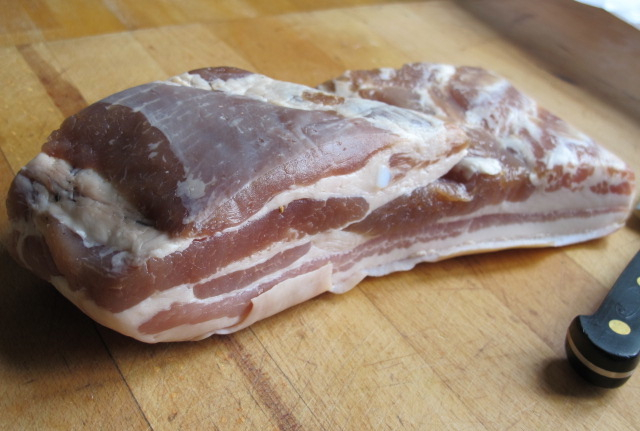 The butcher told me the pork roll was ‘parsleyed’ (‘persille’) – I thought he meant stuffed with parsley, but he laughed and corrected me – it actually refers the lines of fat running through the piece , ‘marbled’ as we might say. Even the Vigneron hadn’t heard of this term, so I was proud to bestow some francais on him. 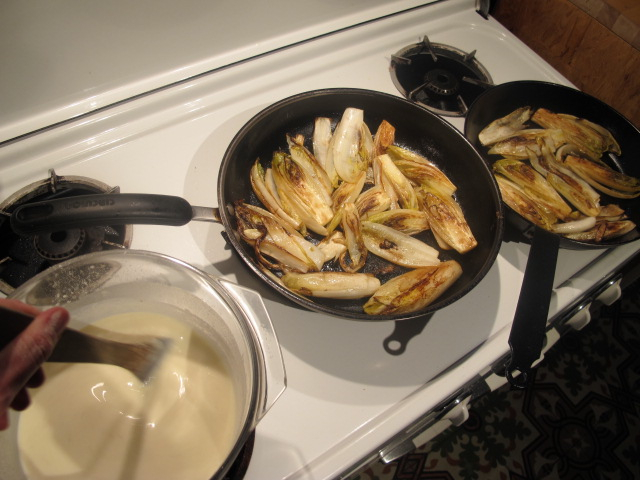 Fry up the onions in heavy cast iron pot with a big chunk of butter (30-40g) and a little olive oil, until golden. 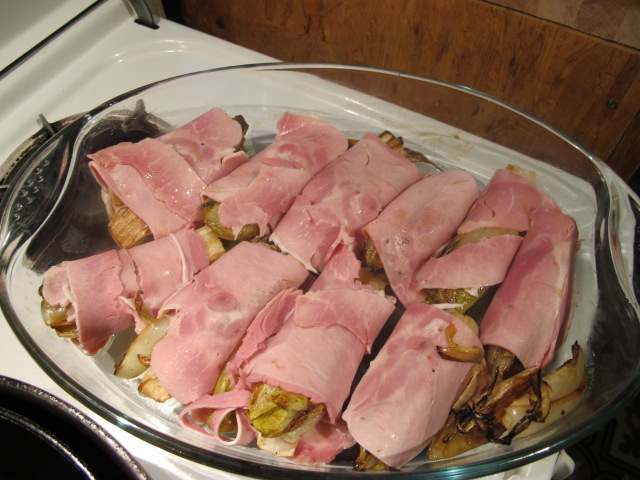 Add the roll of pork and brown on each side over medium -high heat. When the meat is almost all browned, add the garlic and salt, pepper to taste. I find garlic burns very easily, so I add it near the end of the browning. Pour over the milk (meat should be 3/4 covered, if not add more ) and add the herbs. Cover with lid and let simmer for an hour. Add the carrots and turnips and keep simmering for another hour. Add potatoes and keep simmering until they are tender. Serve with lashings of dijon mustard on the side and a big white or red wine! N.B. If this is prepared the night before eating, I don’t add any of the vegetables until the next day. 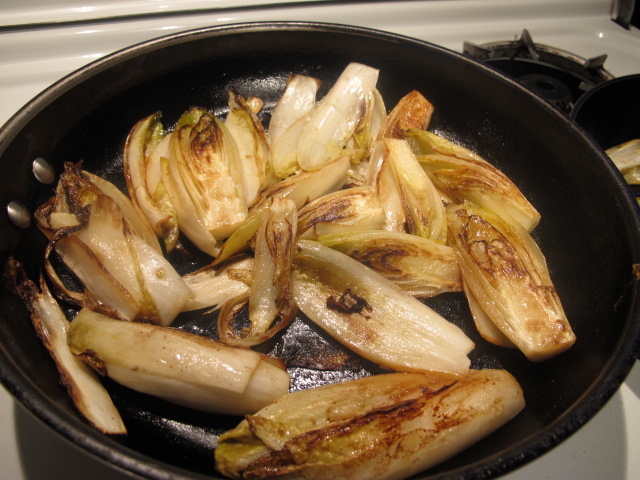 ‘Witlof’, ‘Chicory’, ‘Chicon’, ‘Endive’, ‘Belgian Endive’… I’m never quite sure what to call this vegetable. Each country seems to have a different name for it. In Australia for example, we call it ‘witlof’? 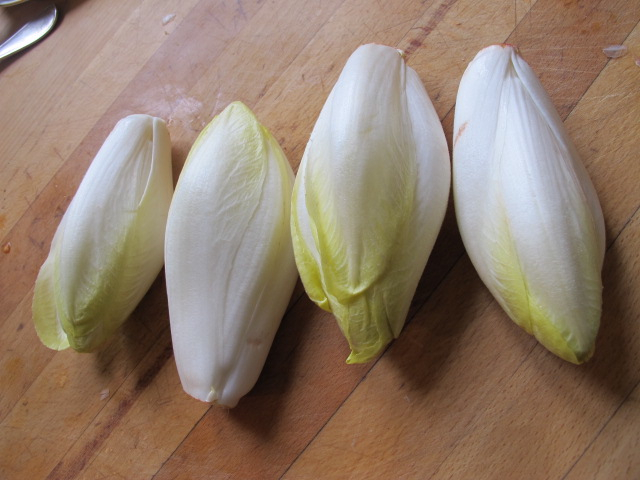 Here in France it is called ‘endive’ and would you believe it has been grown commercially since only the 1930’s. Whatever the name for it, since moving to France I have developed a huge liking for this interesting vegetable from the Chicory family. Thanks to Benji and his mum, I was introduced to a beautiful new ingredient and a few recipes that are now family favourites. Even our six-year-old loves eating them. Endives are so verstile – they make a great salad when served raw with vinaigrette drizzled over it or, the particular family favourite, when braised with white wine and lardons and parsley, over a gentle heat for a few hours (the longer the better, you want them to caramelise!). You can serve this dish on its own or it makes a great side dish to lamb chops, veal or pork. During the first few weeks of us living back in Australia in 2004, I decided to prepare the family favourite for our friends who we were lodging with. I was so excited to share this newly-loved vegetable of mine. After quite a search, I finally found them in a fruit and veg shop in North Fitzroy. I filled the bag, enough for four people and when I went to pay I nearly fell over. They were so expensive! I concealed my shock and quietly paid the money, vowing never again to buy this vegie in this suburb again. 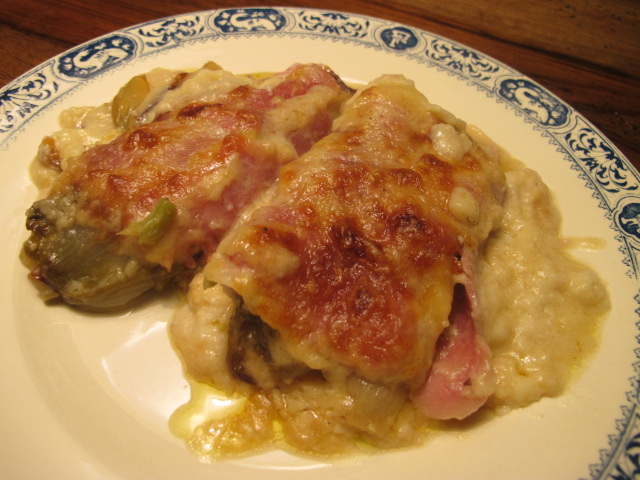 I at last appreciated why Claude (my Frenchie – amazing cook – friend who was living in Western Australia with his NZ wife), when he had yearnings for a good old endive dish, would only use three or four of them in a gratin. Braising them en masse was a complete luxury. 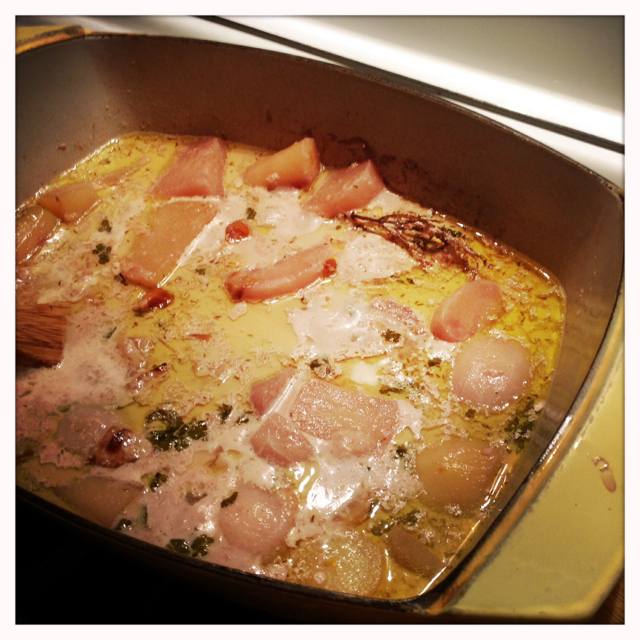 Anyway – big sigh of relief – the dish worked out pretty well that evening, but not to be repeated for quite some time! Here in France however, they are cheap and we eat them regularly, especially around October. A few years ago, I had to prepare a lunch at the last minute for some friends of friends travelling through the area. I added pan-fried chicken thigh fillets and julienned carrots to a pot of left-over braised endives and the result was really delicious. One of our lunch guests, the owner of a well-known bakery in Melbourne (yeah, not much pressure), was keen to get the recipe. High five! I was tres contente. I’ve been adding the chicken and the carrots for many a meal since. 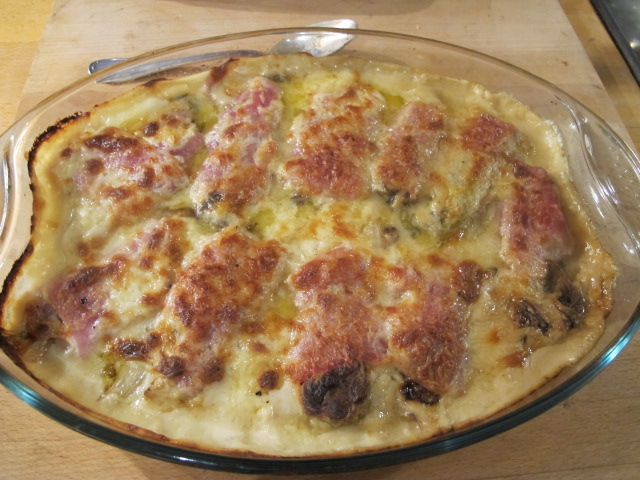 But much to my husband’s relief (I’m someone that could eat the same dish 4 times in the one week if I like it), I’ve branched out and tried a new recipe – the traditional ‘Gratin d’Endives au Jambon’ (Endives and Ham Gratin). Once again, as is usual for all the recipes I prepare, this is pretty simple and easy to make. 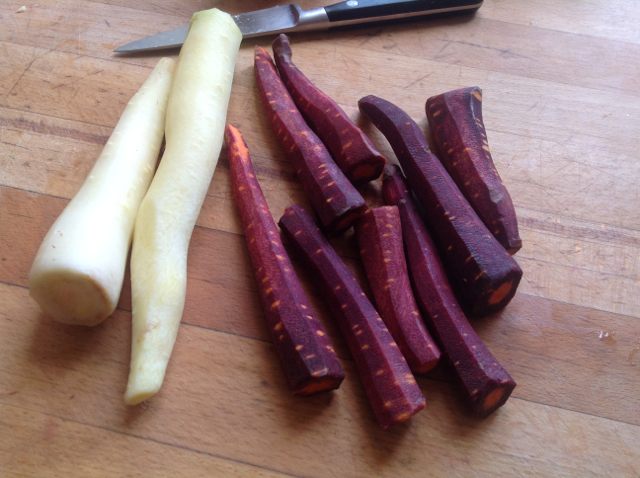 It is a particularly good dish for the Autumn-Winter months and with today’s maximum temperature reaching six degrees celsius, I think I should get to it and make some. Stir in flour with a wooden spoon and cook for a few minutes over a gentle heat, stirring continuously. Once it comes to the boil, add the cheese and stir until melted. 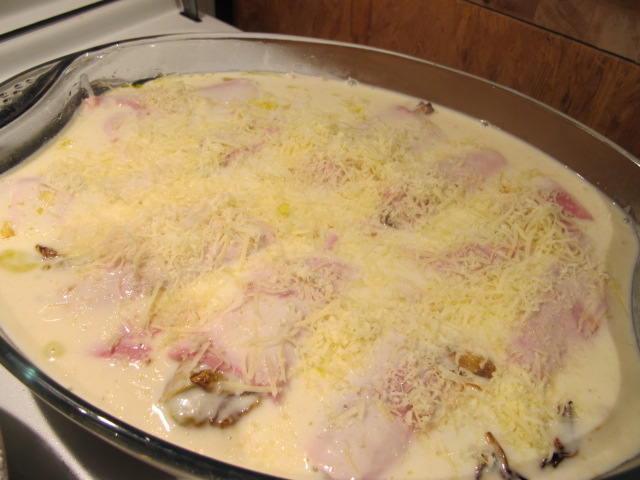 Place the wrapped endives in an oiled gratin/baking dish. 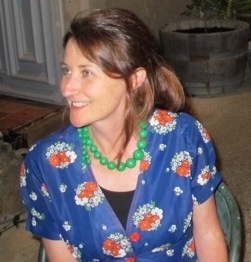 Nothing like keeping the monsieur happy – and at this time more than any other. Harvest time means good, honest, country cooking and this very simple (the best kind!) lentil dish is a winner in our house. It’s easy and so versatile – it’s great on its own or delicious paired with country sausages, pork chops, lamb chops, whatever you feel like. They say that dried pulses were a staple in many homes during the harsh Winter months, a time when people also consumed more preserved, salted meats (no wonder I feel like large slabs of juicy ‘petit sale’ with my lentils). And it’s another one of those dishes that tastes better and better each day it gets older! I first tried this dish here in France at Benji’s parents’ house. A large cast-iron pot was plonked in the middle of the table and we helped ourselves to this comfort-food’ – the country sausages (mmn, like a bit of country saucisse, but not these!!) swimming in a dark brown-green mass of steaming lentils, with dollops of Dijon mustard, soaking it all up with crusty bread and wine. Pour boiling water to cover well. N.B. 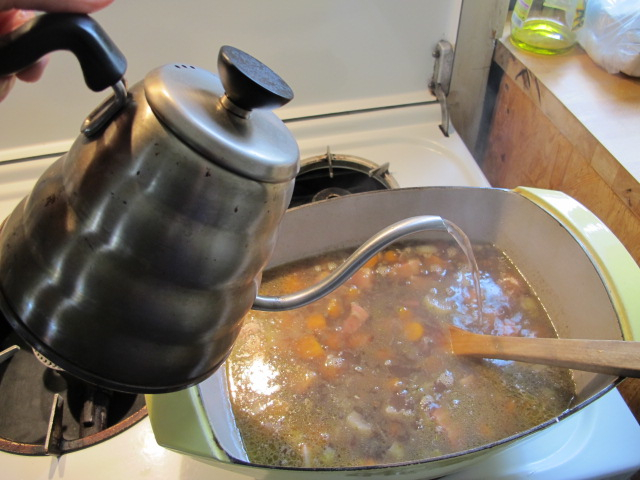 During the cooking, you will find that the lentils soak up a lot of water, you may need to add a second pot of boiling water over the mixture if you have no liquid left. I know, it may look like you are drowning the lentils with water, but believe me it does dry up! Add herbs and pepper to taste. N.B. 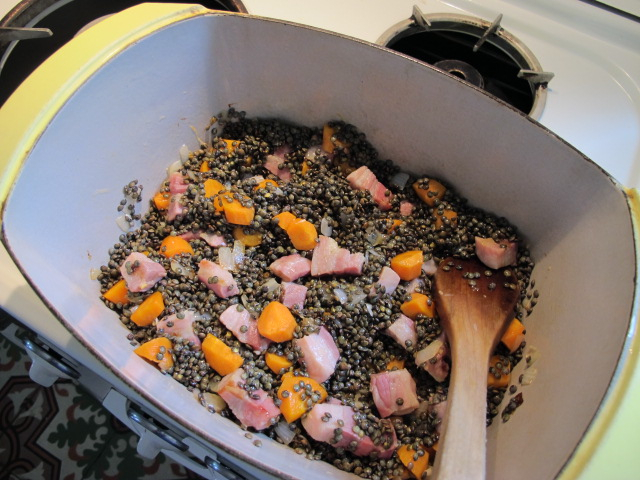 You do not need to add salt if using the salted pork (I’ve made that mistake!) – but if you’re not using meat DO NOT salt at this point. 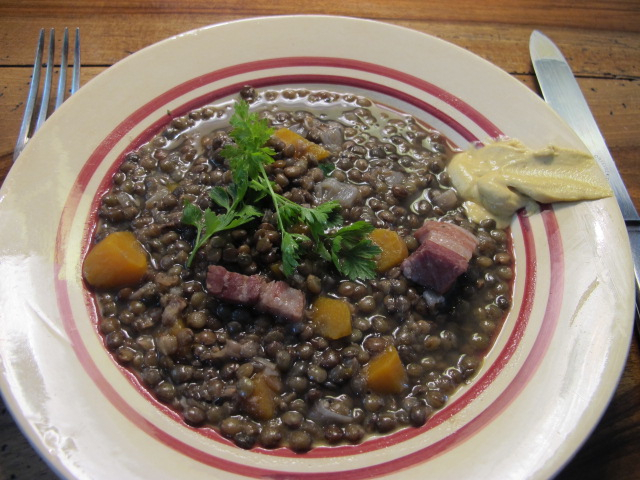 – adding salt to lentils during cooking may toughen them up. Add it after the cooking. Cover with lid and let simmer for one hour (if you have too much liquid, leave the lid slightly ajar) – or until lentils are tender.